While a hotel can be the perfect place to relax, with staff to cater for your every whim, self-catering holiday accommodation can offer an excellent, exclusive alternative. With friends or family, you can enjoy a comfortable temporary home in a lovely part of the country, peace and quiet with the freedom to do what you want when you want. Barns Tower is just such a place, with its unique, miniature "Scottish castle" sleeping just two people - the perfect, romantic retreat. The Vivat Trust - Holidays in historic buildings - is a national preservation company, with charitable status, with the aim to renovate neglected buildings of architectural and historical importance. The properties are sensitively refurbished for holiday accommodation, the rent then used to maintain and preserve the buildings. 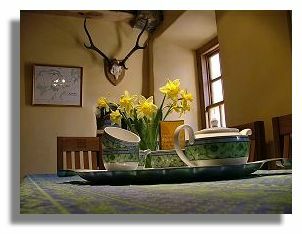 There are three historic homes in Scotland run by the Vivat Trust where you can stay for a few days or a week: The Tower of Hallbar near Lanark, The Cloister House, an early 19th century mansion near Melrose Abbey, and now, just recently renovated, Barns Tower near Peebles in the Scottish Borders. This is a most unusual "holiday cottage" featuring just one double bedroom. Due to the steep staircase and general historic nature of the Tower, with rooms on four floors, it is not suitable for the elderly, infirm or children. The journey to Barns Tower is quite an experience in itself. Given directions from the main road from Peebles, the country road turns into a farm track so take it easy on the muddy rutted road. Then when you least expect it, you suddenly turn the corner and partially hidden by trees is the Tower standing majestically in front of you. 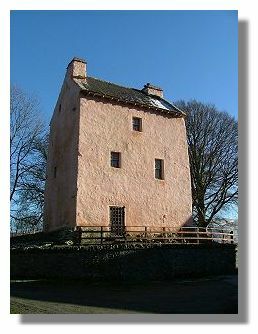 This ancient defence tower was built in the late 16th century on the banks of the River Tweed within a country estate for William Burnet, the 4th Laird of Barns and his wife Margaret Stewart of the House of Traquair. Their initials W.B and M.S are carved above one of the upper floor windows. Tower houses were built following an Act of Parliament in which James V of Scotland requested that all noblemen with land valued over £100 to erect a 30ft square tower, which would protect their household. Cattle thieving across the English/Scottish border was rife at this time and therefore these tall towers could accommodate livestock in an enclosure with the family housed upstairs. While Barns Tower has been altered over the centuries and recently refurbished to provide accommodation with modern facilities, the original architectural design with thick walls, hearths and stone staircases is still carefully preserved. The painstaking restoration was a major project as the Tower had been uninhabited for 200 years, with walls and roof in a poor state of decay. In order to preserve the Tower as it was, many of the original doors, timber beams and joists were retained and the exterior and interior walls repointed and restored. Where replacement beams, doors and door handles were required, all wood was sourced locally from oak, fir and elm trees on the estate. Barns Tower is a unique, miniature, intimate "Scottish castle" perfect for a romantic retreat for two. 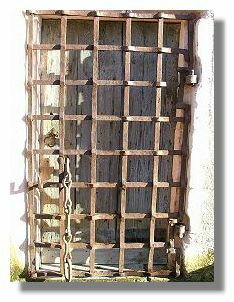 You'll certainly feel safe and secluded as you shut the original oak front door, protected by an iron Yett, a heavy gated grille. On the ground floor is a vaulted basement, now used for a boiler, drying and storage room, as well as a new power-shower room and toilet. 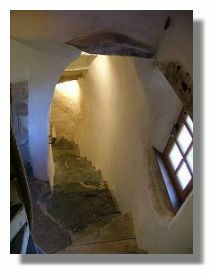 Then up a steep curving flight of worn stone steps to the first floor and the kitchen. This former Great Hall has been magnificently refurbished, maintaining the original flagstone floor and huge hearth, with the addition of a fully-fitted farmhouse-style kitchen. Next we climb a wooden turnpike staircase, with a rope banister to help you up to the next floor where you'll find the charming and cosy sitting room. Juxtaposed beside the 18th century hearth and open fireplace are a contemporary sleek and shiny black leather sofa and reclining armchair, coffee table, television/ video recorder, radio and a pile of books. It's a stunning and brilliant interior design concept to contrast old and new, creating a homely modern setting within this ancient building. The bold and innovative design continues as we climb the final wooden spiral staircase up to the bedroom high at the top of the tower beneath the rafters. As this is after all a former aristocratic family home, there's a huge King-size bed, beautiful furnishings, rugs and fabrics, dressing table and chairs. The pale wooden bedroom floor is created from a single tree, a 110-foot Colorado White Fir, which grew a few yards from the Tower. Cleverly hidden behind a crimson velvet curtain is the en-suite bathroom. To give a sense of period style, you will bathe in a sumptuous, deep clawfoot bath, large enough for two, with the perfect accessory -a chrome attachment for two champagne glass holders. 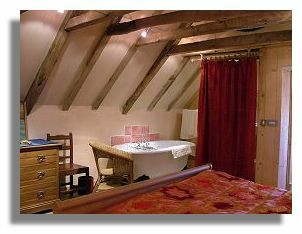 This is undoubtedly the place to stay for a romantic weekend a deux! Staying here for a few days is simply terrific fun as you quickly learn to duck your head for low door lintels and clambering up and down the spiral staircase. This is a boy's own adventure for adults. At the far side of the bedroom is a secret passage hidden behind a thick curtain - a steep stone spiral staircase leading down to the sitting room below as a quick short cut. While this is an ancient stone tower, all modern comfort and facilities have been carefully considered with sufficient radiators in all the rooms. However, it may be chilly at any time of the year, so be prepared to light a log fire in the kitchen or living room. Piles of ready cut logs and baskets of old newspapers are supplied with instruction on the best way to light the fire. There is nothing more comforting than the sight and warmth of a roaring fire especially these enormous old hearths, which would at one time have cooked an entire pig or stag for the family presumably! What a wonderful atmosphere the fire creates. On a dark February evening, with a snow blizzard blowing outside, it was absolutely magical to relax in the sitting room after supper in front of the blazing fire. The huge farmhouse kitchen - designed again using wood from estate trees for the units and worktops - is completely fitted out with all facilities and utensils to create all your meals from breakfast to a banquet. Here you'll find a fridge, freezer, electric hob, microwave, dishwasher, full set of saucepans, food processor, coffee machine, crockery and everything you might need from wooden spoon to corkscrew. A welcome pack of tea, coffee, pint of milk, sugar, and biscuits as well as a bottle of wine will be waiting for you. While only two people may be accommodated at the Tower, you would be able to entertain with the long refectory table and seating for at least 10 people. The beautifully carved elm and ash wood table and chairs are designed and made by local craftsman, Tom Roebuck. It is convenient to cater for yourself staying here. There are a couple of supermarkets, individual food stores and an off licence in Peebles, about 5 miles away. If you are staying for a few days, you could always have a meal out, with a good range of local hotels, restaurants, bars and bistros in town. The kitchen is so well designed with everything you may need, that to prepare a meal here is most enjoyable. Even if there are just two of you, sitting at the long table, is great fun making you feel like lord and lady of the manor. And with a dishwasher too, domestic duties are minimal. 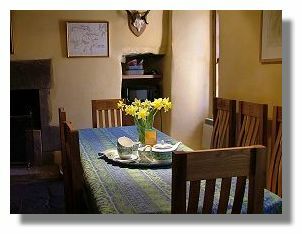 As a change from hotel living, when breakfast and other meal times are restricted, at Barns Tower, you can eat when and what you wish within the privacy of your own tiny Scottish castle. 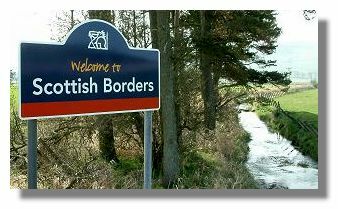 A television/video recorder is supplied but the reception is not ideal in this part of the remote Borders. Perhaps bring a selection of videos, CDs and books for your own choice of entertainment. Most thoughtfully there is a game of Scrabble and a pack of cards supplied for a nostalgic evening playing childhood games in front of the fire. Barns Tower is the perfect place to hibernate, read and relax. The Tower is part of the Wemyss farming estate and there are miles of country walks all around, with guest access down a private path beside the elegant mansion, Barns House, down to the River Tweed. A public right of way runs through part of the estate for walkers and horse-riders - a popular sight on a Sunday morning. Guests of Barns Tower are also supplied with garden furniture and a barbecue for a perfect summer lunch al fresco in the Arboretum nearby. This is a popular area for fishing, golf, horse-riding, walking, hill-climbing, and generally touring around. 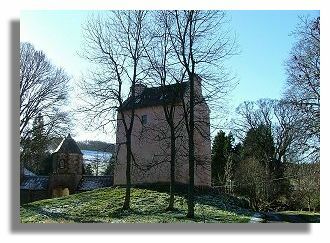 The Border towns, such as Melrose, Hawick, Galashiels, Jedburgh and Selkirk are famous for their historic abbeys, castles as well as its traditional textile industry. Browse around some of the Mill shops for some bargains in cashmere sweaters, scarves, kilts and tartan. Enjoy the peaceful Borders countryside by day then relax in front of the crackling log fire by night. This intimate, magical, tiny fairytale Tower is the ultimate romantic retreat. For more information or to make a reservation see the Vivat Web site.